Four staff members from the NWA national office visited Puerto Rico and the US Virgin Islands January 22 to 30 as part of a series of listening sessions with WIC staff in various parts of the country taking place from last fall through this spring. 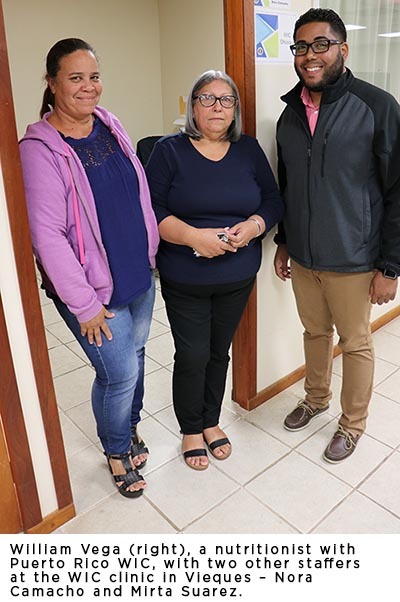 One of the staffers on that visit to the Caribbean, Stephen Padre, NWA’s communications manager, wrote this article as a glance into what the national office staff heard and saw during their time with Puerto Rico and US Virgin Island WIC staff. See his previous article on Puerto Rico WIC here, and expect future articles on the Virgin Islands part of their visit in the coming weeks. What is your commute to work like? Do you live in a metropolitan area and deal with gridlocked highways on a daily basis? Or do you live in a rural area and drive long distances? How would you like to take a ferry to work regularly? That’s what William Vega does. He’s a nutritionist with Puerto Rico WIC, and living on an island and providing services to the most far-flung parts of the region is part of the territory. Two days a week, Vega works at the WIC clinic on Vieques, a smaller island off the eastern side of the main island of Puerto Rico. Vieques is a half-hour or hour-long ride on a ferry, depending on which type he takes (passenger-only or one for both vehicles and passengers). Three days a week, he goes to the WIC clinic on Culebra, another island off the eastern side of the main island and 1 ½ hours away by ferry. The caseload at the Vieques clinic is 400 participants. The clinic is housed in a building with other state-provided services, such as Medicaid, which makes it convenient for participants. There are only 44 WIC participants on Culebra. Vega says one of his biggest challenges as a WIC staff member is transportation. In addition to the longer and more arduous commutes across bodies of water, he says getting around on the islands is hard too. In the weeks and months following Hurricanes Maria and Irma, which hit Puerto Rico hard in September 2017, getting around the territory was especially difficult as roads were blocked. In addition to cut transportation lines, other lines – those for phones and internet – were cut too. Most of those connections have been restored, although some clinics in parts of Puerto Rico still do not have landline phone service restored, and staff are relying on cell phones to communicate. One of the major challenges for WIC staff across the territory in the hurricane recovery is dealing with the bureaucracy of the territorial government. Buying replacement printers for damaged clinics to print out benefit checks for participants (Puerto Rico WIC is still transitioning to EBT) is a long and arduous task because of the procedures put in place by the government of Puerto Rico. Nevertheless, WIC staff in Puerto Rico like Vega are dedicated to their work and providing excellent service to participants. As Vega says, the best part of his job is the impact he can have on WIC participants as they make positive changes in their lives.